Eyewear market is anticipated to registered healthy growth rate owing to rising cases of eyesight problems among people along with the increasing geriatric population base rate which has resulted in the purchase of more eyewear products. Rising cases of myopia and hypermetropia among adult as well as children are also expected to support the industry expansion. Moreover, the growing trend of wearing spectacles and sunglasses as a fashion sense coupled with the introduction of innovative eyewear products to meet the need of the customers is also projected to augment the market demand. Furthermore, the rising purchasing power of individuals along with the growing awareness among people regarding eye protection will also favor the market growth over the forecasted timeline. As per the latest report added by Value Market Research, the Global Eyewear Market was valued USD 123.1 BN (by revenue) in 2018 and is anticipated to reach USD 197.6 BN by 2025 with a CAGR of 7%. Spectacles are dominating the product segment owing to rising geriatric population base who increasingly preferred spectacles in order to overcome visual impairment and cure refractive errors. Also, the rising trend of wearing spectacles as a fashion statement coupled with the rising need to protect eyes from UV sunrays further accelerating the segment growth. Optical stores are dominating the segment and are likely to maintain their dominance over the forecast period. Optical stores are highly preferred sales channel by customers as they offer a range of services including eye examinations as well as consultation from practiced optometrists. 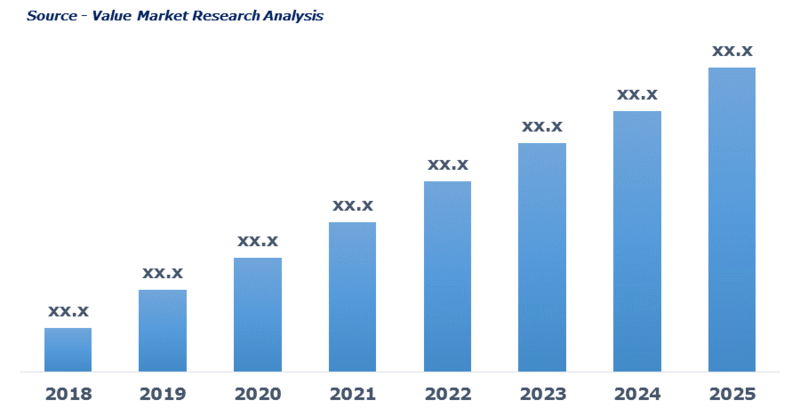 Rising adoption of eyewear across different age groups along with the high demand for advanced eyewear product is augmenting the North America market growth. An increasing number of people using corrective eyewear products along with the growing aging population is also expected to propel the regional market growth. Bausch & Lomb, Carl Zeiss, Chairman Group, Chemilens, CIBA Vision (Alcon), Cooper Vision, Daemyung, Essilor International, Fielmann, Hoya, Johnson & Rodenstock and Johnson Vision Care and Seiko among others. As per this study the Global Eyewear Market was valued USD 123.1 BN (by revenue) in 2018 and is anticipated to reach USD 197.6 BN by 2025 with a CAGR of 7%. Eyewear refers to the accessories or wearable used to protect eyes from dirt, dust, and sunrays. It includes spectacles, contact lenses, safety goggles, and sunglasses that impart protection from various external factors. Among these spectacles and contact lenses are mainly used to enhance visual acuity whereas sunglasses are used for fashion purpose. Rising usage of laptops and smart phones is one of the major factors boosting the demand of prescribed eyewear. Increasing prevalence of myopia and other optical deficiencies in youths is another factor driving eyewear market growth. Development of scratch resistance and unbreakable eyewear followed by rising awareness regarding eye protection is further fueling the market growth. However, growing count of population undergoing LASIK treatment is likely to hinder the eyewear market growth. This detailed market study is centered on the data obtained from multiple sources and is analyzed using numerous tools including porter’s five forces analysis, market attractiveness analysis and value chain analysis. These tools are employed to gain insights of the potential value of the market facilitating the business strategists with the latest growth opportunities. Additionally, these tools also provide a detailed analysis of each application/product segment in the global market of eyewear. The broad eyewear market has been sub-grouped into product and distribution channel. The report studies these subsets with respect to the geographical segmentation. The strategists can gain a detailed insight and devise appropriate strategies to target specific market. This detail will lead to a focused approach leading to identification of better opportunities. Furthermore, the report comprises of the geographical segmentation, which mainly focuses on current and forecast demand for eyewear in North America, Europe, Asia Pacific, Latin America, and Middle East & Africa. The report further focuses on demand for individual application segments in all the regions. The report also covers detailed competitive landscape including company profiles of key players operating in the global market. The key players in the eyewear market include Bausch & Lomb, Carl Zeiss, Chairman Group, Chemilens, CIBA Vision (Alcon), Cooper Vision, Daemyung, Essilor International, Fielmann, Hoya, Johnson & Rodenstock and Johnson Vision Care and Seiko among others. An in-depth view of the competitive outlook includes future capacities, key mergers & acquisitions, financial overview, partnerships, collaborations, new product launches, new product developments and other developments with information in terms of H.Q.